We continue to struggle with what sorts of foods Dougie will eat. We decided that perhaps he would be more interested in eating if he helped to prepare the food. We had noticed he was more likely to sample something during the cooking process than when it was just on his plate. So, we enlisted him to help with the latest meal. This particular meal is Jamie Oliver’s Sizzling beef with scallions and black bean sauce. 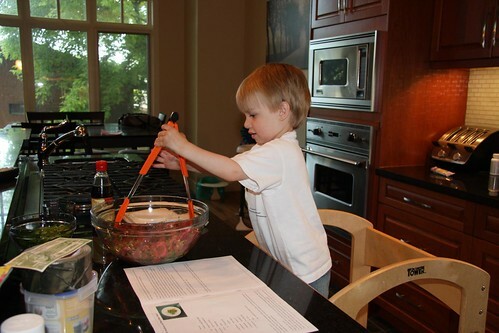 Dougie loved helping toss the meat and adding things to the bowl. Since it was raw meat, he couldn’t really taste it as we went along though. When it came time to eat, he didn’t want to eat it at all. 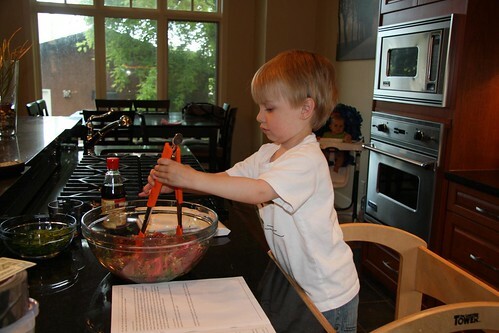 Guess we’re back to the drawing board for ideas – but at least he learned some cooking skills.